According to him, there are a total of approximately 70 thousand Indonesian citizens who are going abroad and there are 74 thousand Indonesian citizens who return to the country. This means, the people are eager and enthusiastic to cast their votes in the election. 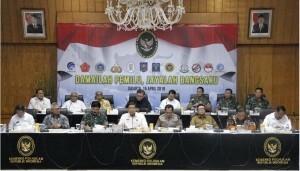 “The public does not need to be afraid and worried because the police, assisted by the TNI (Indonesian National Defense Forces), will guard the elections,” Wiranto said. Furthermore, the Minister stated that the lack of electoral equipment due to unexpected things—such as flooding and due to the increase in polling stations—had been overcome by sending the intended equipment this morning. On that occasion, he also asked the public not to immediately celebrate victory of presidential and vice-presidential candidate in a parade after the quick count is carried out. “It is better not to do this because it can spark a commotion,” he added. Regarding the discrepancy ratio on the allocated time and the voters abroad that resulting dismissal of queuing voters, the Minister emphasized that even though the time is up but if there are still registered voters who are present, they will be given time to cast their vote. “So, it is not limited to 13:00 local time,” he said.